​Photos by John Reynolds, Kim Wetten with the VIU Bird Banding Project, Misha Warbanski, and Brian Starzomski. 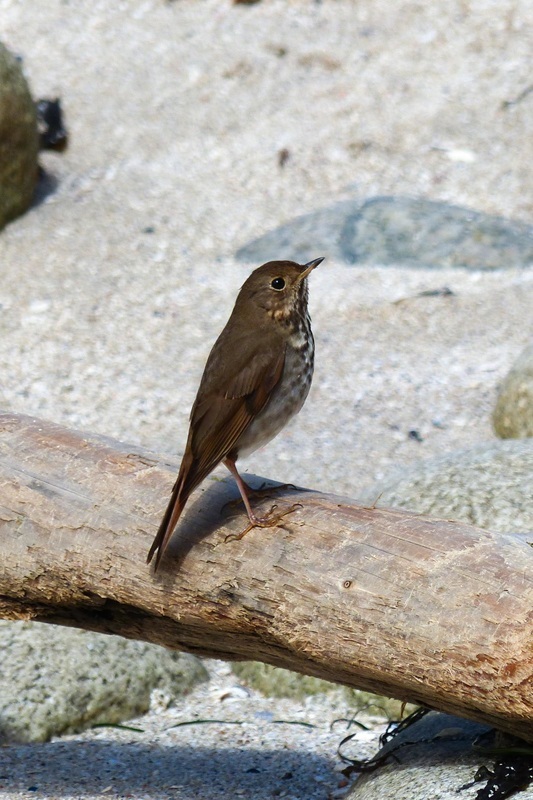 The hermit thrush is a medium-sized but robust songbird. It has a rich medium brown head and back, reddish-brown tail, and pale underside marked by spots and smudges on the neck and breast. Its bill is straight and slender, and it has a pale but not prominent eyering. The hermit thrush stands upright with its bill slightly raised. Its song is a beautiful flute-like whistle with a longer, sustained first note. The hermit thrush is more often heard than seen. Click here to listen to its song. 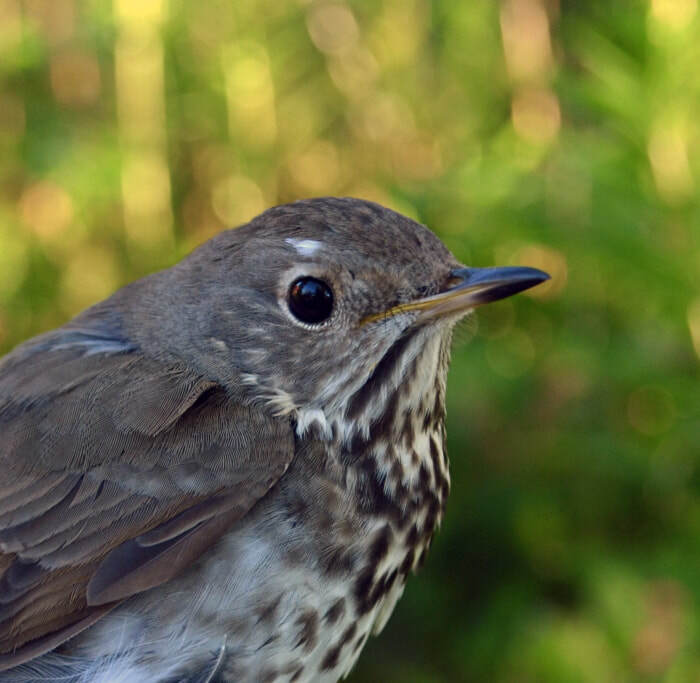 The hermit thrush can be found in the understories of mature forests, especially around forest edges or openings where it hops and scrapes at leaf litter to find food. It is a common species throughout BC in the summer breeding season as well as during the spring and fall migrations. 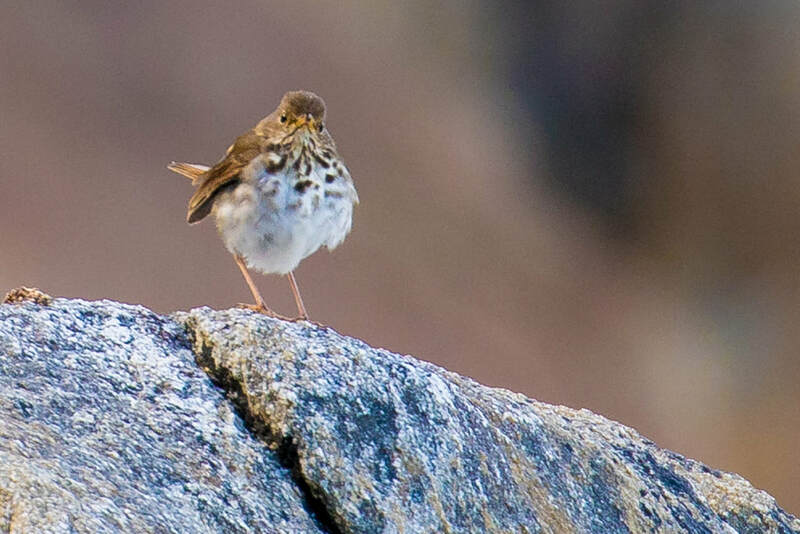 While most populations head to the southern and western United States during the winter, some hermit thrushes remain in southern coastal areas of BC year-round. ​Find more information at the British Columbia Breeding Bird Atlas here. 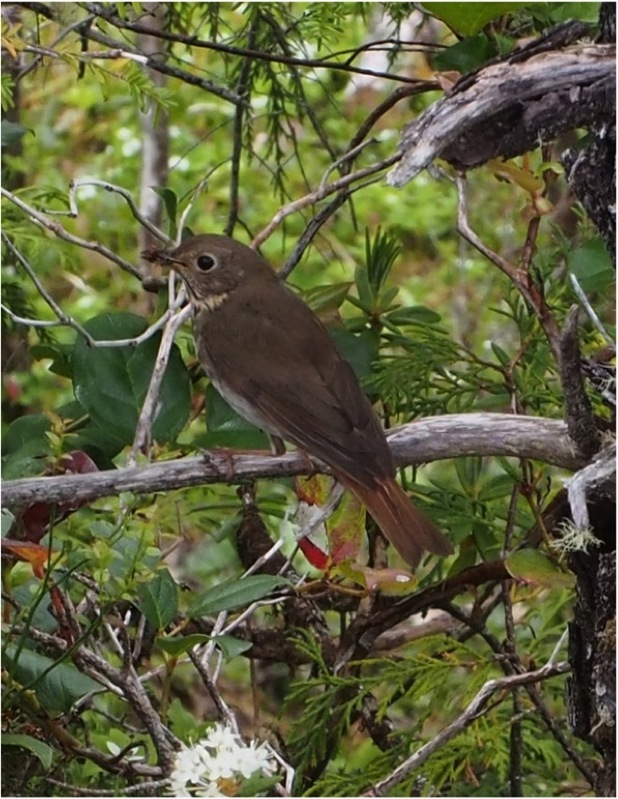 The hermit thrush can be distinguished from the Swainson’s thrush (Catharus ustulatus) by its red-brown tail. The spotting on its breast and neck is also dark and more prominent. Click here for a photo comparison. Hermit Thrush forage for a variety of berries and invertebrates, and especially spiders and insects during the breeding season. Click here for detailed information on biology, life history, and distribution. Hermit Thrush. The Birds of North America Online (A. Poole, Ed.). Ithaca: Cornell Lab of Ornithology. Retrieved from the Birds of North America Online. Accessed 11/08/2014. Fenneman, J. Catharus guttatus Pallas. In Klinkenberg, Brian. (Ed.) E-Fauna BC: Electronic Atlas of the Fauna of British Columbia. Lab for Advanced Spatial Analysis, Department of Geography, University of British Columbia, Vancouver. Accessed 11/08/2014. Sibley, D. A. (2003). The Sibley Field Guide to Birds of Western North America. Andrew Stewart Publishing, New York, NY. Misha Warbanski, Kelly Fretwell, and Brian Starzomski (2014).